Terry Case Carpets are a friendly, local carpet supplier in Wimborne, Dorset that has been established for over 35 years. Terry Case Carpets believe in traditional service and great value offering a huge choice of carpets, wood flooring, laminates and vinyls to residential and commercial clients. Commercial flooring projects range from office blocks and schools to nursing homes and hotels. Terry Case Carpets use a vast array of flooring materials and have the experience to advise and install commercial flooring with the minimum disruption to your business. Commercial flooring services cover Poole, Bournemouth, Ringwood, Verwood, Dorset & Hampshire. Terry Case Carpets have fully trained staff who can advise you on what carpets will suit your property and your budget, including a good range of discounted carpet remnants. Carpets are widely chosen for their warmth and comfort underfoot, but choosing the right carpet for a staircase or a busy lounge can be confusing, so let the team at Terry Case Carpets guide you. Free no obligation measure and quote available for carpets in Poole, Bournemouth, Wimborne, Verwood, Ringwood and surrounding areas of Dorset. 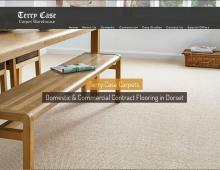 Contact Terry Case Carpets today.